Aikido, though praised as a healthful system of self-defense techniques, would be nothing apart from the laws of the great universe. The martial way begins and ends with courtesy, itself an attitude of thankfulness to and reverence for nature. To be mistaken on this basic point is to make of the martial arts no more than weapons of injury and death. Koichi Tohei (20 January 1920 – 19 May 2011) was a 10th Dan aikidoka and founder of the Ki Society and its style of aikido, officially Shin Shin Toitsu Aikido (literally "aikido with mind and body unified"), but commonly known as "Ki-Aikido". The very name Aikido indicates its dependence on the laws of nature, which we term ki. Aikido means the way to harmony with ki. Only those with their eyes open to the world of nature are capable of uncovering its truth. Everything springs from a sense of gratitude toward nature. All of the forces of science have been unable to conquer nature because it is too mystic, too vast, too mighty. It intensely pervades everything around us. Like the fish that, though in the water, is unaware of the water, we are so thoroughly engulfed in the blessings of nature that we tend to forget its very existence. Only those with their eyes open to the world of nature are capable of uncovering its truth. Everything springs from a sense of gratitude toward nature. 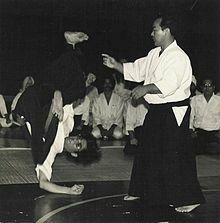 Aikido, though praised as a healthful system of self-defense techniques, would be nothing apart from the laws of the great universe. The martial way begins and ends with courtesy, itself an attitude of thankfulness to and reverence for nature. To be mistaken on this basic point is to make of the martial arts no more than weapons of injury and death. The very name Aikido indicates its dependence on the laws of nature, which we term ki. Aikido means the way to harmony with ki. That is to say, Aikido is a discipline to make the heart of nature our own heart, to understand love for all things, and to become one with nature. Techniques and physical strength have limits; the great way of the universe stretches to infinity. The true way to success is exactly one and the same as the principle of non-dissension, and that is the way of peace. Human beings cannot grow without feeling gratitude. Gratitude towards things is an attitude which fosters growth. The ki of the universe has never for a moment stopped moving. We call this continuous growth and development. Do you think it strange that human beings seem to be the only one trying to stop the movement of ki? Mind and body were originally one. Do not think that the power you have is only the power you ordinarily use and moan that you have little strength. The power you ordinarily use is like the small visible segment of an iceberg. When we unify our mind and body and become one with the universe, we can use the great power that is naturally ours. Like the calm still surface water that reflects the moon and a flying bird, true living calmness is the condition of our mind that reflects all things clearly. This is our original and natural state. By understanding these principles, we can acquire true living calmness. The absolute universe is one. Then two opposing forces appeared, and the relative world was born. In the orient this dualism is called ‘yin’ and ‘yang’, in the west, ‘plus’ and ‘minus’. The subconscious mind acts as a storehouse of knowledge and past experiences. The materials stored in the subconscious mind form the conscious mind. Henceforth let us cease putting any minus materials into the subconscious. Let us always extend plus ki and live our life with a positive attitude. We begin with the number one in counting all things. It is impossible that this one can ever be reduced to zero. Because just as something cannot be made of nothing, one cannot be made from zero. Ki is like the number one. Ki is formed from infinitely small particles, smaller than an atom. The universal ki condensed becomes an individual, which further condensed becomes the one point in the lower abdomen, which in turn infinitely condensed never becomes zero, but becomes one with the universe. Thus we understand the essence of ki. It is easier to coordinate mind and body when we are sitting or standing still than when we are in motion. But true unification means to maintain the coordination of mind and body even when we are moving. Breathe out, so that your breath travels infinitely to the ends of the universe: breathe in, so that your breath reaches your one point and continues infinitely there. The ki breathing methods are an important way of unifying mind and body. At night when all is quiet and calm, do this alone, and you will feel that you are the universe and that the universe is you. It will lead you to supreme ecstasy of being one with the universe. At this moment the life power that is rightfully yours is fully activated. We have learned coordination of mind and body and the "ki breathing methods". Therefore we can bring the ki of the universe into our bodies at anytime. When a water pump is dried out, no water can flow from the well up through the pump. To start this flow again we must put some water back into the pump. In the same way, ki does not flow strongly in a person suffering from illness or misfortune. Let us practice "kiatsuho" to put back into these people, stimulate their own flow of ki, and give them a fresh start to happiness. An old oriental saying tells us, ‘when our willpower is concentrated upon a stone, it can pass through it. When our willpower is focused and in harmony with the universe, it can command the wind, rain and thunder’. But from where does our willpower come? Those who understand and answer this question are those who accomplish important tasks. When we coordinate mind and body by stilling the waves of our mind to imperceptible, infinitely decreasing ripples, we can send forth our great willpower that moves the universe. Just as the number one never can be reduced to zero, once we act or speak, our action or speech is never completely erased. An old oriental saying tells us, "sow good, and the harvest will be good. Sow evil and reap evil". We must understand that everything we do comes back to ourselves. Therefore before wishing for our own happiness and welfare and that of our children, we must do good in secret. To do good in secret means to act without seeking attention and praise, to act without any hope of reward. This is called "intoku". Among the various ways of performing intoku, to walk the way of the universe and to lead others along this way is best. Nature appears to us in four seasons. The spring is bright and warm, the summer lazy and hot. The fall is decked with colour with a trace of sadness, and the winter frosted and severe. Similarly, the movement of shin shin toitsu aikido are rich and varied. There is both severity and kindness, speed and calmness. It is designed to express the many moods and characteristics of men and women, young and old. But if it for one moment varies from the principles of the universe, it is no longer aikido with ki. "Do nothing" does not mean "don’t do anything", "mu" or "nothing" is not merely the lack of something. It refers to the state in which the mind has grown imperceptibly calm, and then allowed things to take their natural course. If you can leave things entirely up to the universe and not put up the slightest resistance, then you can pass the highest level of ki tests. Things appear very complex but underneath they are quite simple. People complicate things by super-imposing their own viewpoints and advantages. If you remove all that is superfluous, most problems have very simple solutions. The ki of the universe has never for a moment stopped moving. We call this continuous growth and development. Do you think it strange that human beings seem to be the only one trying to stop the movement of ki? Even if you learn something quickly with your conscious mind, you will easily forget it after you stop practicing. That which is learned with the subconscious mind is not easily forgotten. Therefore to learn something with the subconscious mind, requires months and years of training. Just because you were able to do it before, do not assume that you can do it as well the second time. Each time you do something, you must return to your beginner’s mind, and give it your best. You must not think of what you learned as belonging to you. Your learning was only possible because of the people who taught you. If you forget this, before you know it you fall under the illusion that you are the only one who can do it, or the only one who understands. This is called being full of yourself. It is wrong to think, ‘I am strong’, because this strength is nothing but weakness turned inside out. You must think how to act within universal principles. Instructors must always be positive. Even if someone fails at something, you must have the energy to help them turn it into success. When teaching, always compare the correct way with the incorrect way, side by side. Then the reasons for the correct way become obvious. You must know both. If you throw a stone into a lake, it makes waves on the surface. Eventually the waves disappear, but just because you can longer see them does not mean that they are really gone. They have just become too small for us to see them. In the same way, we calm our mind by half, half, half... and the waves of the mind become infinitely calm. They never actually stop. When your techniques are rough it means you are forcing against the principles; proof that you are still immature. You will not be able to stand up to a stronger opponent — you must try to follow the principles. Your character comes out in your techniques. So do the habits of your mind. By correcting the techniques, you can correct the bad habits of your mind. If you constantly collide with others in your practice, your mind will develop a habit of clashing with other people. The purpose of ki-aikido is not self-defence; that is a mere by product. It is far more important to learn to control the mind and body. It is too late to try to calm the mind after you take up the sword. First you must calm the mind and then take up the sword. When you raise the sword up overhead, do not cut your ki. Continue to calm the mind by half, half, half and create a living calmness in that infinite reduction. When practicing cutting with the sword, you will find infinitely more value in cutting just five to ten times with ki fully extended, than you would in cutting a thousand time with mere physical strength.